He said Matobato’s testimony at the ongoing Senate investigation on extrajudicial killings was part of the plan B of the Liberal Party to destroy the credibility of President Duterte and impeach him to be able to install their own president. 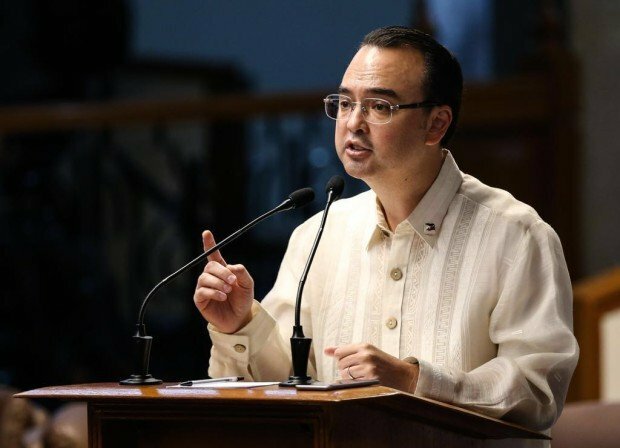 “The witness is telling 100 per cent lies,” said Senator Cayetano in an ambush interview on Thursday after the Senate hearing on extrajudicial killings. At the Senate hearing, Cayetano questioned the intention of Senate Committee on Justice for presenting a witness with no proper corroboration. “I’m asking about you, [Sen. Leila de Lima], your motive, and the motive of your party in this hearing… I am testing whether [the witnesses are credible] or is this part of the plan B of the Liberal Party para makuha ang Malacañang at manira lang,” Cayetano said during the hearing. He also disputed claims of De Lima that there were now 3,526 fatalities in the drug war, saying there were only 1,506 killed during Duterte’s term. Cayetano cried foul at Senator Antonio Trillanes IV who engaged him in “trash talk” to intimidate and stop him from interpellating during the Senate hearing. During the televised Senate hearing, Trillanes was also seen switching off the microphone to stop Cayetano from talking.